A teachers' union has called for tighter controls on the use of mobile phones in schools after a teacher was cleared of the attempted murder of a pupil. During the trial of Peter Harvey it emerged that pupils had been trying to provoke him and capture his reaction on a mobile phone. 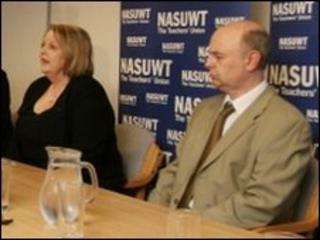 An "explosive" combination of a stressed teacher, bad behaviour and mobile technology had led to the tragic circumstances of the case, said the NASUWT teachers' union. The union's general secretary Chris Keates said the lessons of the case had to be learned. Ms Keates spoke to reporters after the jury at Nottingham Crown Court cleared Mr Harvey of attempted murder and causing grievous bodily harm with intent. He had attacked a pupil at All Saints' Roman Catholic School, Mansfield, in July 2009 after returning from several months' sick leave for stress and depression. Ms Keates said: "What we had in that classroom was an explosive situation of a combination of a teacher who was in a fragile state, of pupils who were set to exploit that fragile state and mobile technology that acted as a catalyst to make the whole situation escalate extremely quickly." The union, which provided Mr Harvey with legal representation, had seen "case after case" of pupils "acting up" for the cameras, she said. It has been campaigning for a tightening of the rules around the use of mobile phones in schools. The government had drawn up some very good advice for schools, Ms Keates said, but it was only guidance and there needed to be a debate about whether it was made more formal. "We believe the time has come now to ask the question whether the guidance is sufficient, given the circumstances we have seen here." "Any teacher who has been following the events of this week will recognise that if you come together with such an explosive combination of events that circumstances like this can actually occur." The case had also raised issues of how schools dealt with teachers suffering from extreme stress, she added. It should not just be a case of "management of sickness absence", she said. There needed to be a debate about how teachers could be supported when they are under extreme pressure and there are issues around mental health, she said. Ms Keates also said schools needed to be sure their policies for dealing with pupils who were repeatedly disruptive were "fit for purpose".